One of the primary features we developed into ActiveG Jayu was the ability to bookmark specific extents on the map. 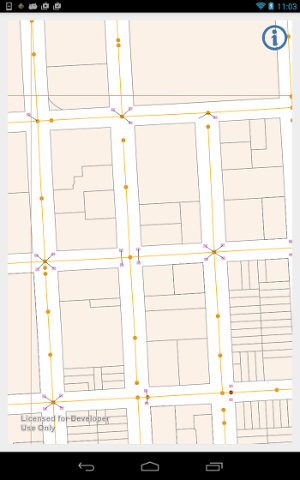 For those new to GIS terminology, an extent is a bounding rectangle defined by coordinate pairs, or in the case of Jayu, what you see in the browser’s viewport. With this feature, the user can bookmark an unlimited number of locations (extents) and select them whenever they’d like to return to that place on the map. In Jayu we use Bootstrap’s btn-toolbar, btn-group, and dropdown-menu classes to create a menu with a “New Bookmark” menu item. See Bootstrap Modals for further documentation. 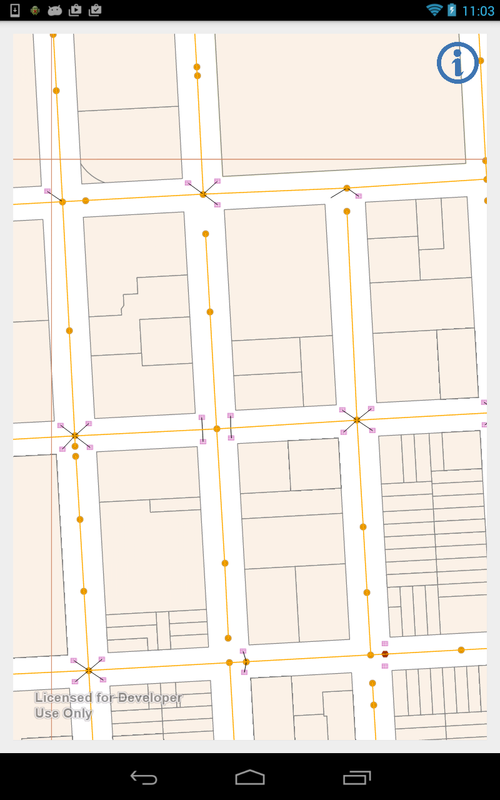 After the user enters the Bookmark name (we’ll call it “Downtown”) and clicks Save, we use the ArcGIS map object’s extent property and xmin, xman, ymin, ymax to save each of the coordinates to an array. This code will set a new extent for the map, and viola, move the user to the saved location! Many people know how to run ArcGIS on a desktop computer, and ESRI provides many tools to do so. But what about workers in the field that need to see a map with specific objects? Running offline maps on an Android device is an extremely useful tool and can help workers do a wide variety of things that before could only be done while sitting in an office. Creating an offline map app on an Android device is something that is possible with the ESRI mobile API, but it can be tricky. So I will go over how to do two fundamental functions on an Android device: 1) Loading the offline map, and 2) querying at a specific location. A file geodatabase, created using ArcGIS for desktop (with the desired layers that you want in the map loaded into it). Create a new Android project in Android Studios, import the ArcGIS libraries and edit the build.gradle file accordingly (See: https://developers.arcgis.com/android/guide/install-and-set-up.htm for more information on how to get your Android app ready for ArcGIS maps). Instantiate an object of that private class in the onCreate method and call .execute() on it. Remember where you put the .geodatabasefile on the device? We’re going to use that now. To add the layers to the MapView, we need to do it one by one. First, we will find the .geodatabasefile and loop through each of the layers that are contained therein, adding them one by one to the MapView. NOTE: the extent of the map will be determined by the first layer that is added on, so keep that in mind when creating your .geodatabase file and adding layers on, due to how our file was constructed, I add them on starting from the back, to get the full extent of the map. It is a very simple, but necessary, first step to getting a complicated, interactive custom ArcGIS application running on your Android device, free of any WiFi connection! In my next blog post I will detail how to interact with the map, showing how to query objects at a point tapped on the map. Stay tuned! 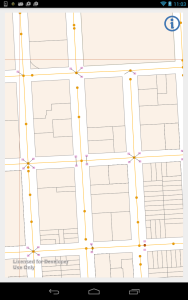 This entry was posted in ArcGIS for Android, InformME, Maximo and tagged Android, ArcGIS, MapView, Mobile Maps on February 25, 2015 by Spencer Smith. 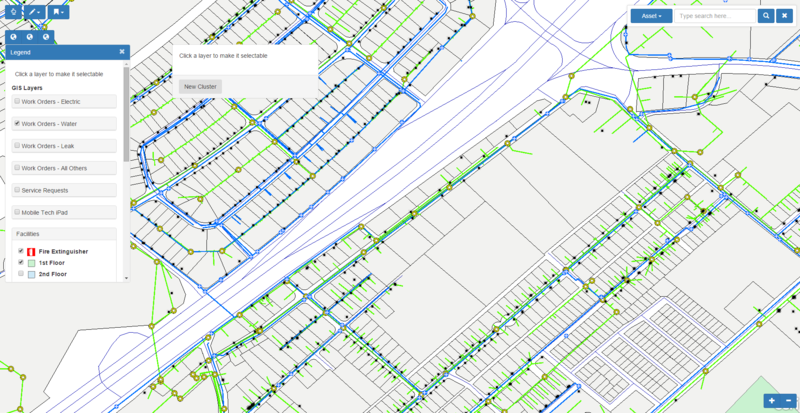 Have you ever wanted to share maps of your Maximo work orders and assets with non-Maximo users? Or ever wanted to integrate your GIS and Maximo, but were afraid of the cost and the effort to make it work? Then you’re not alone. And that’s why we’ve created Jayu (pronounced Jah-Yoo). Jayu is a robust standalone web application specifically tailored to integrate GIS and Maximo data, making it accessible to whomever you choose. Jayu is the perfect blend of simplicity and power, giving your entire organization the access to a visual feature set based upon Maximo data. Jayu builds upon the rich functionality of ActiveG MapEngine, and extends those tools to anyone in your organization. Requires IIS 8+, SQL Server 2008 or later, Esri ArcGIS Server 10.x, and Maximo (of course). So give us a call today to see how quickly you can be up and running with a GIS-based map for your Maximo data! This entry was posted in MapEngine, Maximo, News on February 19, 2015 by ActiveG. Oftentimes, creating, updating, or deleting an MBO is accompanied by other related MBO actions that should either succeed together or fail together within a single database transaction. For example, we recently added a feature to our mapping software that allows a user to select an asset on the map and enter meter readings for all of the active meters associated with that asset. We wanted to treat that collection of meter readings as a single bundle so that if, by chance, one of the input readings were to cause the database to fail to save, we didn’t want any of the other meter readings to save. In the database world, this property is just one part of being ACID-compliant and is usually how people prefer their database to operate so that the database isn’t left in some partially incorrect or incomplete state. However, for performance reasons or for seeing steady progress in a long operation, it may be desirable at times to avoid transactions. Yet, this case should be rare. Always strive for transactions first and then choose to back away if needed. Both IBM and Bruno provide some useful discussion on how child MBOs obtained via relationships from parent MBOs are contained in the same transaction as their parents. It should be noted that the above snippit is only a partial solution of how to correctly record meter data and has been gutted and rearranged for illustratation purposes. Notice that the call to assetMeters.save() is sufficent to persist both the assetMeter update as well as new additions to measurementSet. It is not necessary to call measurementSet.save() because the parent MBO tracks its children in the same transaction. Unfortunately, this fails to save meter data except for the very last meter. This leads to a crucial observation: even though assetMeters is declared above the loop, the setWhere() call resets the transaction. We must call setWhere() only once on the MBOSetRemote on which we will call save(). meterList is a String that is built up by iterating through the meters array. We also iterate through the actual MBOs instead of the meters (and reference a new map not shown to get the JSON data passed in). The main point is that setWhere() is only called once to prevent new transactions from being saved. However, building up meterList is not ideal. Another approach to do this, as noted by Chon, is to create assetMeters using a child relationship of some other MBO (e.g., an Asset) from another MBO set (e.g., an Asset set). This would obviate the need to build up the meterList. Instead of calling assetMeters.save(), we could call save() on the parent MBO set (AssetSet). This entry was posted in Java Development, Maximo on February 11, 2015 by Paul Winward. Last year we finished a new product that integrates ESRI’s ArcGIS maps to Maximo. But unlike our flagship product, MapEngine, this new product can be run from outside of Maximo using any browser. 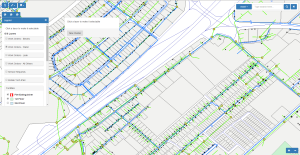 We developed this so non-Maximo users such as managers would have access to the GIS and GIS-related Maximo data (like asset and work order physical locations). One of the main requirements for this new product was a simpler, more modern interface. In implementing this we had to hide many of ArcGIS’s canned visual components and replace them with our own. We chose Twitter’s Bootstrap CSS library for its cross-browser compatibility and current styles. One ArcGIS component that needed to be replaced were the Zoom In and Zoom Out buttons. Here I am going to step you through the process of hiding the default buttons and replacing them with Bootstrap buttons. Once the buttons are added we need to add the event handlers that the buttons will use to Zoom In and Out. This took me a bit of time to figure out how to tell the map to Zoom In and Out, because ESRI chose to call the different Zooms “levels.” So we use the API’s setLevel function to zoom the map in and out one level at a time. Be sure this code is added after the map is created. Once the setLevel functions are set using jQuery’s click event and an anonymous function, clicking the plus and minus buttons will zoom the map in and out one level at a time. Our colleague Kurt Hassey of Santa Clara Valley Water District gives activeG props in a recent ESRI news article. Thanks for the shout out, Kurt! This entry was posted in News on April 12, 2013 by ActiveG. A ctiveG won the IBM Tivoli Best of Show Award for its InformME product on March 2, 2013 at the IBM Pulse Convention in Las Vegas, NV. ActiveG displayed InformME’s ability to create and manage work orders and assets visually, in a mobile environment. During the competition involving 10 other IBM Business Partner solutions, ActiveG’s team demonstrated how InformME, built on the Interloc Mobile Informer platform, helps mobile users organize work based on location in disconnected GIS environment. The judges were impressed with InformME’s ability to create and update linear work orders by drawing on the mobile map to mark the areas of work, and then see that information replicated in core Maximo. 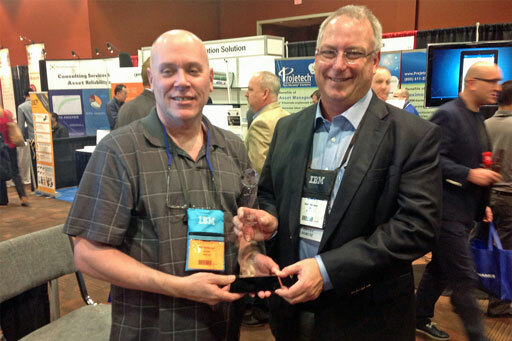 ActiveG Supreme Commander, Don Anderson, accepts the 2013 IBM Tivoli Best of Show award from IBM’s Mark Register. For more information on how ActiveG InformME can help your company improve its mobility solutions with map-based visualization in connected and disconnected environments, see the InformME page, or contact ActiveG today. This entry was posted in InformME, News on March 5, 2013 by ActiveG.